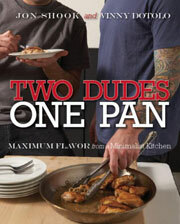 Authors Jon Shook and Vinny Dotolo note that a heat-proof silicone rubber spatula is “really pliant and makes getting under the eggs easy. No matter what, never use a metal spatula on a nonstick pan. It’ll kill the nonstick coating.” There you have it. Although we’ve made similar Spanish tortillas in well-seasoned cast-iron skillets to truly terrific effect. 1. Heat the olive oil in a 12-inch nonstick skillet over medium-high heat. 2. Add the potatoes and 1 teaspoon of the salt and cook until the edges of the potatoes are transparent, 5 to 7 minutes, stirring occasionally. Stir in the onions and cook for 1 minute, stirring often. Reduce the heat to medium and cook until the potatoes are tender and slightly browned, 6 to 8 minutes, stirring occasionally. Turn the potatoes and onions into a bowl and set aside. 3. Melt the butter in the skillet, then add the chorizo and let it brown for 2 minutes. Add the potato mixture back to the skillet. 4. Whisk the eggs with the cream and the remaining teaspoon of salt in a medium bowl until combined. Pour over the potatoes, sprinkle with the cheese, and cook until the eggs start to set, 1 to 2 minutes. Using a heat-proof silicone rubber spatula, push the eggs to the middle of the skillet once or twice so the raw eggs on top run under the cooked eggs to the bottom of the skillet. Cook until the eggs are set on the bottom and nearly set on the top, 2 to 3 minutes. 5. Place a rimless plate (it should be larger in circumference than the skillet) or a large, flat pot lid on top of the skillet. Carefully flip the skillet over and lift it off; the tortilla should be on the plate. 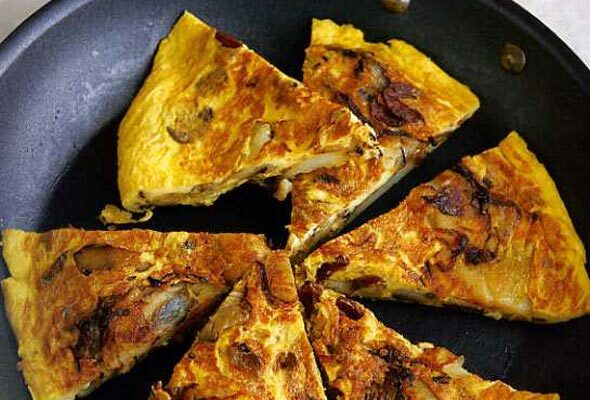 Slide the tortilla back into the skillet and cook the second side until the eggs are to your liking, 2 minutes for a soft tortilla, a minute or two longer for a hard one (we like our tortilla soft in the middle, so we cook it for less time). 6. Slide the tortilla onto a plate and cool. Slice into wedges and serve. Spanish Tortilla with Manchego and Potatoes Recipe © 2008 Jon Shook | Vinny Dotolo. Photo © 2008 Kathryn Russell. All rights reserved. All recipes and photos used with permission of the publisher.